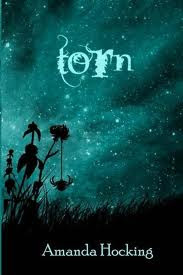 Torn is the second book in the Trylle Trilogy. I started this book yesterday afternoon and finished it today. I'm also already a few chapters into book 3... and I'm also already sad that I'm nearing the end of the series. I can tell I'm not going to have gotten enough of Wendy, Finn, Loki, Tove and... I could just keep going. The characters are all just so real in my mind. I'm going to miss them when I'm done. Wendy definitely finds a better understand of how her life has gotten to the point where she is now. She learns more about why things have happened. A lot of history is learned. History about Wendy's family. History about Finn's family. History the Trylle society... and why they are at odds with the Vittra. I'm always kind of amazed when author's can write in a way that makes you believe in a whole new world. Of course... maybe I'm also easily impressed with worlds of fantasy and romance. I can't wait to find out how the story ends... but I'm also really not looking forward to being finished.